The San Jose Sharks shut down a lot of talk about playoff success last season, heading all the way to the Stanley Cup Final against the Pittsburgh Penguins. They lost the series in six games and gained a valuable learning experience along the way, knocking off the Los Angeles Kings, Nashville Predators and St. Louis Blues. The Sharks will take to 2016-2017 with relatively the same group. Mikkel Boedker and defenceman David Schlemko were among the additions, while Nick Spaling, Roman Polak, Jeremy Morin, and goalie James Reimer left via free agency. The same central group is intact, which should make for another beard-filled ride to the finish line. According to general manager Doug Wilson and head coach Peter DeBoer, the main issue is speed. The additions are designed to address the absence of quickness, which certainly was a factor as the Sharks faced off against the Penguins, but this is a roster that still features 11 of the top 13 forwards from the Western Conference champs. 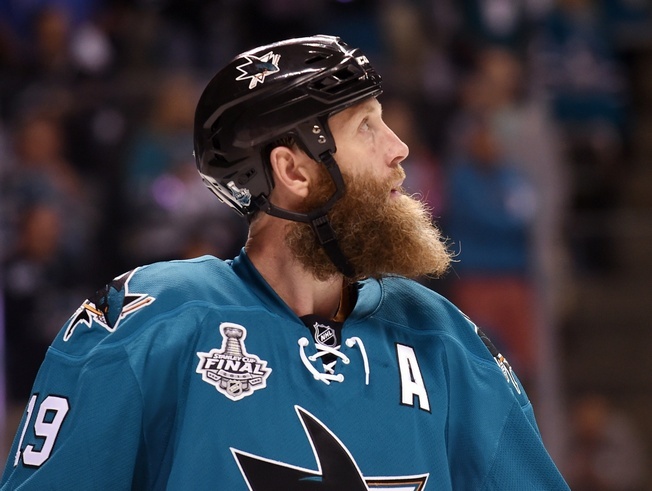 37-year-old centre Joe Thornton was a point a game last season, registering 82 points in 82 games. Eight of his 19 goals came on the power play. In the post-season, the big guy put up 21 points in 24 playoff games. He averaged 19:39 of ice time a game. Thornton continues to have one of the biggest reaches in the NHL and plays an intense style that makes use of his 6’4, 220-pound frame. The other Joe, 32-year-old Joe Pavelski, averaged 78 points in 82 games last season. A dozen of his 38 goals came on the power play and he averaged 19:48 of ice time per game. Pavelski had 23 points in 24 playoff games, including 14 goals. He is a sublime playmaker and plays well with and without the puck, even if a lack of speed is a factor. Logan Couture had a tremendous season, with 36 points in 52 games. But he really came alive in the playoffs, where he led the league with 30 points in 24 post-season games and averaged 19:21 of ice time. He was everywhere in key situations and always seemed to be in the right place. Couture will continue to find his spot in 2016-2017. Tomas Hertl was good for 46 points in 81 games last season, including three power play goals. He’s not the most consistent scorer, but he is capable of highlight-reel breakouts and can slip into all three forward positions. He managed 202 shots on goal in the regular season and put up 11 points in the playoffs, including six goals. Brent Burns can play forward or defence, so it can be hard to know exactly where to put the 31-year-old on a depth chart. The whiskery wonder had a whopping 75 points in 82 games last season, including seven goals on the power play. He averaged nearly 26 minutes of ice time a game, fired off 353 shots on goal and even came up with a shorty. Marc-Edouard Vlasic plays a mature, calculated game. The 29-year-old from Montreal had 39 points in 67 games and averaged 23:07 of ice time a game. He is mobile and makes few mistakes, but he also displays a certain apprehension in the offensive zone. He does what’s asked of him. reach and can move the puck. Martin Jones took to his first NHL season as a starter and finished third overall in wins and second overall in shutouts. He was 37-23-4, with six shutouts and a goals against average of 2.27. In the post-season, he was even better. He posted three shutouts in 24 games, with a save percentage of .923 and a goals against average of 2.16. With Reimer no longer in the fold, it looks like the Sharks will push for either Aaron Dell or Mantas Armalis to hold down the backup spot. Dell is the frontrunner according to most analysts, but he lacks NHL experience. Luckily, San Jose allows few shots per game and plays a containment game that eliminates chances. Swiss winger Timo Meier is projected to arrive in the NHL this season and he’s been turning a lot of heads in the organization. The 19-year-old may need a few weeks of conditioning with the Barracuda in the AHL first, but the Sharks love his size and skill and believe that he has a role in the top six. Meier is quick and can pass the puck well, plus he’s hard to knock off the biscuit. Markus Sorenson is another possible arrival for 2016-2017. The 24-year-old Swedish winger plays a two-way game and was a standout at development camp. He was drafted by the Ottawa Senators in 2010 but did not sign with the club. Two years ago, Sorenson was rookie of the year in the SHL. Last season, he put up 34 points in 47 games with Djurgardens IF. It’s more of the same for the San Jose Sharks. This is a deep, impressive hockey club. They’ve made a few additions that should help with overall speed, but Thornton and Co. will continue to play an imposing brand and will punish the opposition. They should be in line for another deep run in the post-season.